Wanted is a film by Timur Bekmambetov loosely based on Mark Millar’s miniseries comics of the same name. Wanted stars James McAvoy, Angelina Jolie, Morgan Freeman, Thomas Kretschmann, Konstantin Khabensky, and David O’Hara. Wesley Gibson (James McAvoy), is a boring account manager with a bullying boss, and a girlfriend who’s cheating on him with his best friend. His life, in his opinion, is simply insignificant. That is until he finds out that his father, (whom he thought walked out on him a week after he was born), was one of the greatest assassins that ever lived, and was recently killed by his arch nemesis, Cross. Cross (Thomas Kretschmann), is a rogue assassin who left The Fraternity. The Fraternity is a thousand year old group of assassins that “kill one to save a thousand,” the group is led by Sloan (Morgan Freeman). 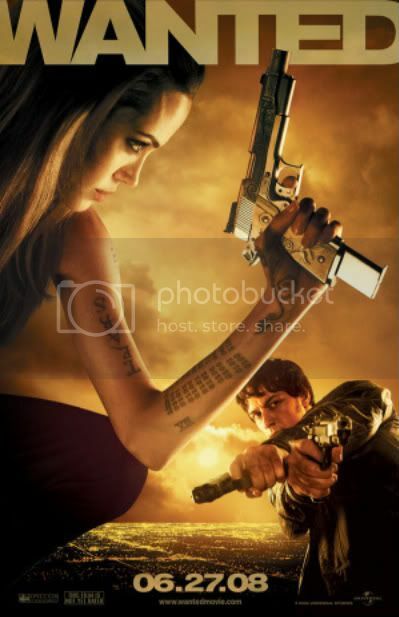 Fox (Angelina Jolie), is the gorgeous assassin sent by Sloan to save Gibson from Cross, and trains him to become an assassin himself so that he can follow in his father’s footsteps. I liked this film, the action was brilliant, brutal, and unapologetic. However, story-wise, I wasn’t necessarily convinced. Some parts lacked originality, you could practically smell the big twist a mile away. I get the intent of the story, but it asks a lot of questions, and kinda gives the wrong answers. Following your destiny is great and all, but is it still so great when you’re destiny is to kill people? This is only the tip of the iceberg. The main idea of Wanted, in my humble opinion, is about fate, faith, and the courage to deal with both. The Fraternity is a group of people who rely on The Loom of Fate for guidance, this can easily be a representation of a number of concepts in our society, namely, religion. Sloan’s character was appointed the leader of the group, but he directly disobeyed The Loom of Fate in order to save himself and earn money. Sloan was, simply put, a priest that went bad. What was so damaging about his evilness is that his followers did not know that he was evil, so they killed whomever Sloan told them to kill. He asked a very important question during his standoff with Gibson and the other assassins, (not verbatim) would you rather save what you believe in, or save your life? The only person who had the courage to completely surrender to what they believed in, was Fox. Of course, that whole idea is just moot because there is nothing good or positive about killing other people before committing suicide so that you can prove a point, no matter how frickin cool you did it. Gibson’s journey throughout the whole film was much too self-centered than it ought to be, after all, his destiny is supposedly affecting thousands of people, but all I saw was him killing lots of people because he’s angry he got played. He was all about revenge, taking control of his life, and following in his father’s footsteps. Pretty clichéd if you ask me. The parts that I loved about Wanted? - Mainly the action scenes, major kudos to McAvoy for not being conscious about his mouth flapping all over the place. _ Cross' character, heartwarming dad in the midst of his cold, murdering reputation. - Rats and peanut butter being used as bombs. Frickin hilarious. - Bending bullets. Frickin wicked. - The fact that the real hero in the story had to commit suicide in order to preserve fate’s orders. And all everyone focused on was how the leading character finally grew some ba- found the guts to live his own life and not take any crap from other people. - The fact that their superpowers were given silly explanations, super-fast adrenaline? Come on, you can should do better than that. - Don't even get me started on the mighty Loom of Fate. - And, what is up with all the CGI scenes? If you can’t flip a car on a bus in real life, then you can’t flip a car on a bus, period. Overall, Wanted is a fun, crude film with a talented cast. It’s a fast-paced, knuckle-whitening, thrill ride that is sure to get your heart pounding. It’s a grade-A action film. No more, no less. “This is me, taking control of my life. Non preoccuparti! [url=http://lacasadicavour.com/ ]compra cialis generico [/url]So un'altra soluzione cialis prezzo migliore Credo che lei abbia sbagliato. Dobbiamo discutere. Scrivere a me in PM, parlare.